I’ve spent days looking at the double convergence panel not knowing how to finish it. 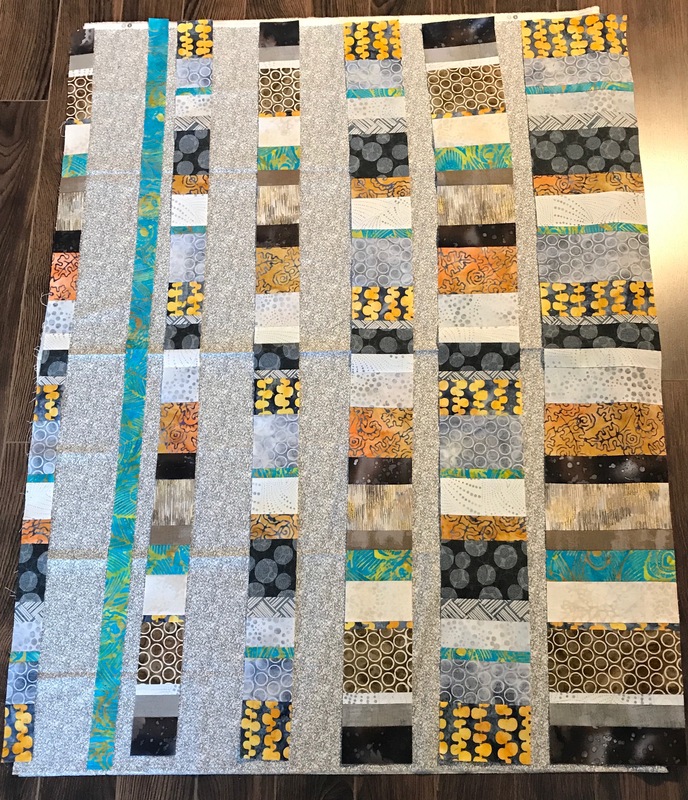 I finally decided to add a narrow dark border, then complete the outer border using the four fabrics I used to construct the convergence. I thought about a second narrow border bringing in another contrasting colour but I couldn’t find anything in my stash (and my stash is large) that felt right – red? pink? green? yellow? I had a grey batik with small yellow circles, that was as close as I could get to something that possibly worked. In the end I elected to stick with just the four fabrics. To construct the outer border, I was limited by the amount of grey and turquoise fabric I had left. I was able to find some of the ombre online and ordered a yard (at great expense!) 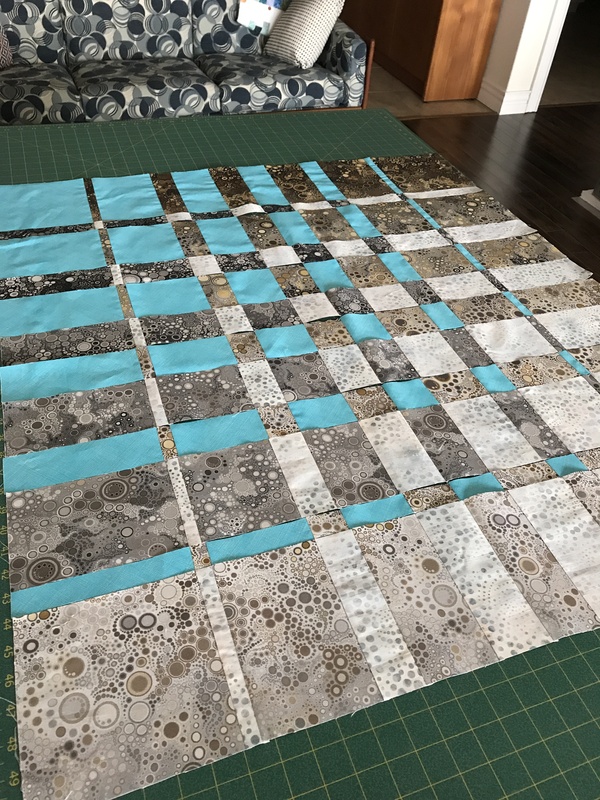 so I had options with constructing the ombre corners but I had barely enough grey and turquoise left to make a 6″ border. 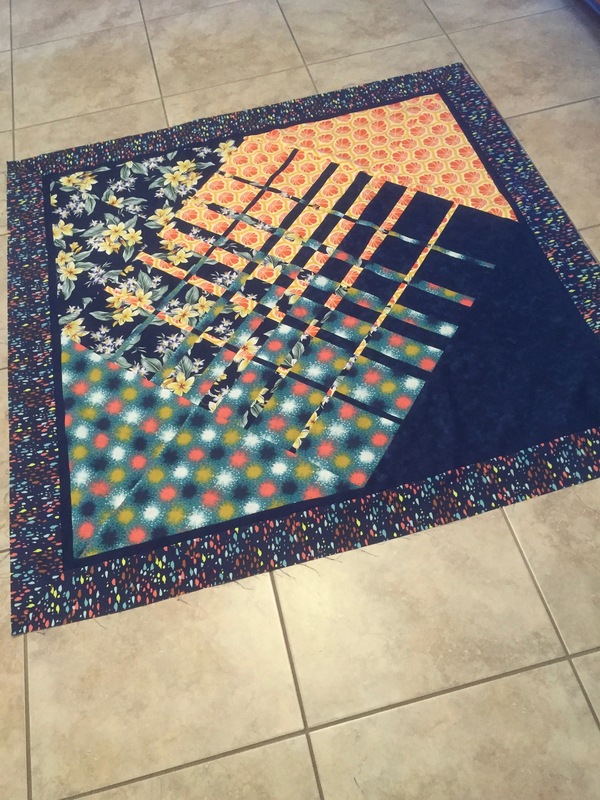 I thought about adding a bit of dark fabric where two fabrics met, but when I photographed the layout I didn’t like how that broke up the unity of the border. I also thought about using a mitre to make the joins but I didn’t have enough fabric to make that work. Looking at the finished panel I’ve decided to finish the quilt with a hidden binding – I have no more grey batik or turquoise and I think using the ombre for a traditional quilt binding will just add unnecessary detail. 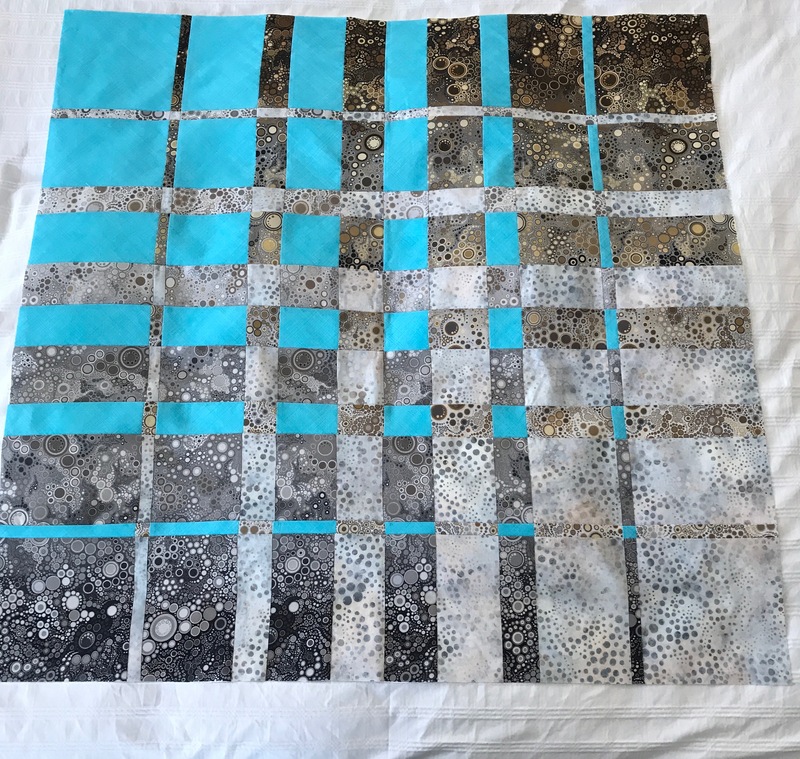 When completed the quilt will be a rather small throw/lap quilt or a largish wall hanging – it’s ended up an awkward size, but I can’t see any way of extending the “length” that wouldn’t mess up the symmetry, so this is it. 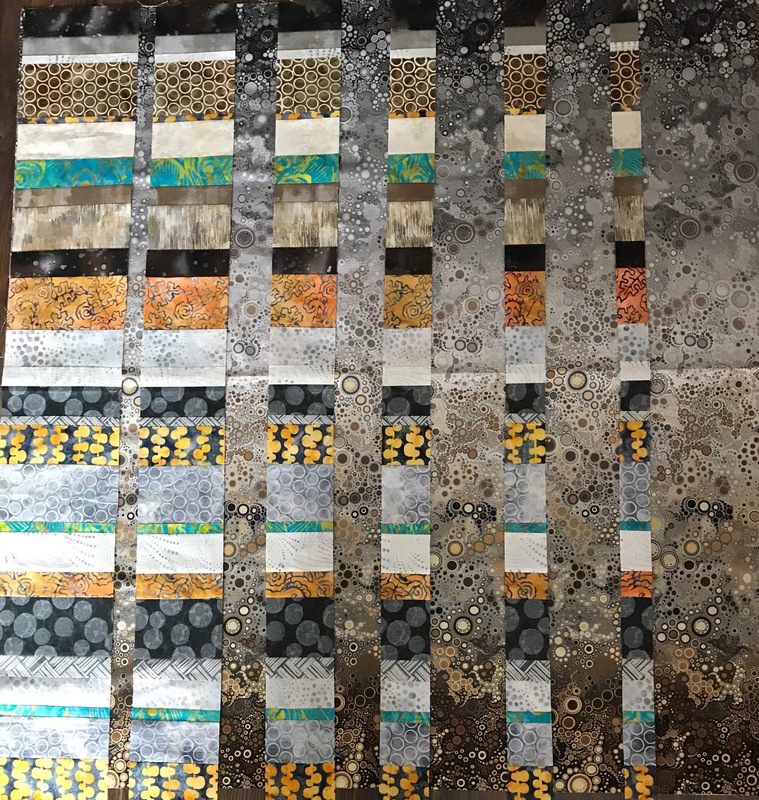 Yesterday I removed the turquoise vertical strip and resembled the quilt top panel – much happier with the flow across the two sets of strips – they’re not interrupted with that contrasting element that really didn’t work well. The colour was right, though, and I used the turquoise fabric to sash the panel – the narrow contrasting sashing provides closure to the panel and brightens it. 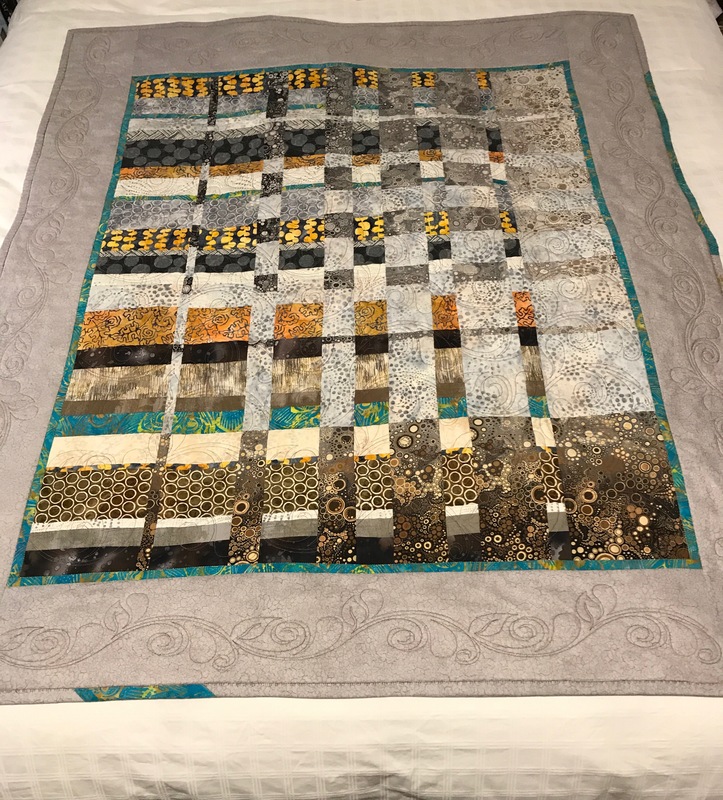 The border – that was a challenge – I had several grey fabrics in my stash – I tried all of them. At one point I thought one of the taupier ones would look OK (I used two different Grunge taupe fabrics in the brightly coloured strips) but in the end I used wide strips from the grey Crackle (Moda) I’ve had in the stash for a while (I thought the fabric pattern was long out of stock but I just found more in a wide range of colours online so I bought two yards to replace the piece I’ve used). Now on to a backing panel with a wide strip of some kind. How I choose to quilt this will also make a difference to how the final quilt will look – quilting design, thread colour should help tie the elements together as well. Today, I looked at the two sets of discarded strips and decided they could go together and kind of work. The miscut ombre strips needed lengthening to match the pieced strips – I used my last bit of ombre (from the dark brown end) to extend them. I sewed the two sets of strips together this afternoon. The width proportions were the same so I put them together wide/narrow, wide/narrow until they were assembled. I don’t like the turquoise strip in there, however – I might actually take it out because it interrupts the flow of the strips in both directions. 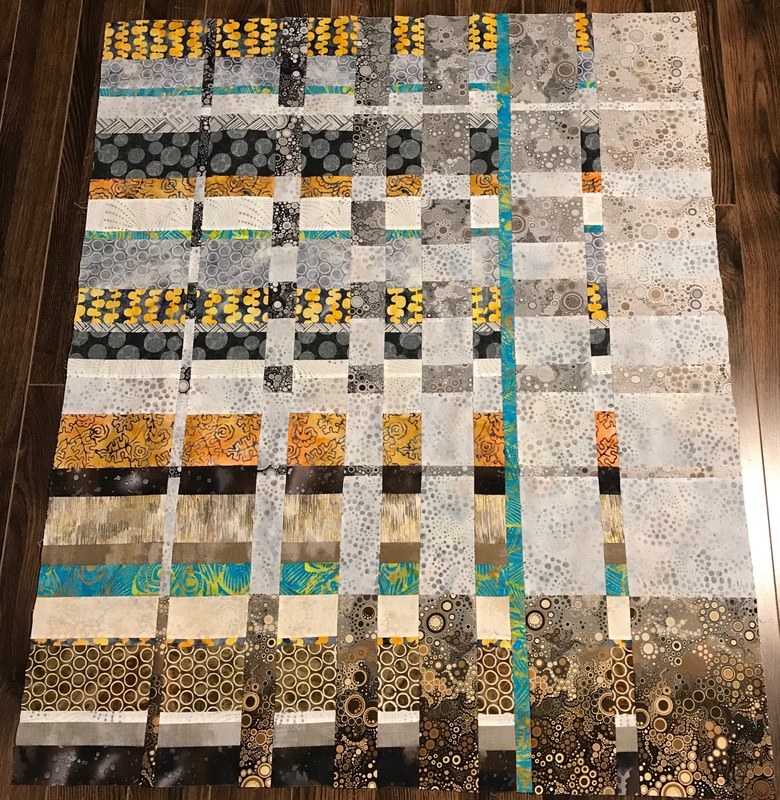 I’ve ended up with a panel 36″ x 43″ – reasonable proportion for a throw/lap quilt with narrow sashing and wide borders added. 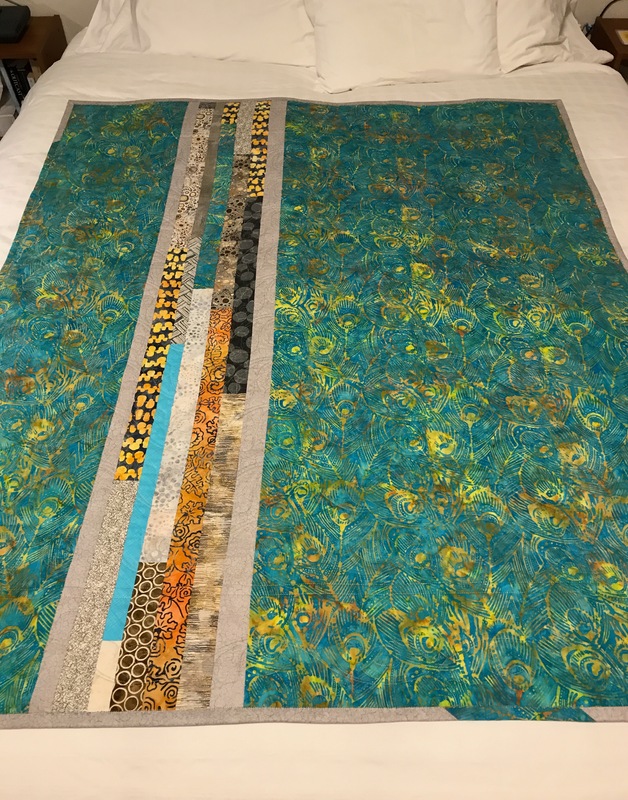 Tomorrow I will take out the turquoise strip, then see what I can do about a narrow sashing and a wide border to get me to around 48″-50″ in width, 56″-58″ in length. And here I am quilting when I intended to be making pants – the corduroy is sitting on the dresser waiting for me to get to it; the pattern is there, too. I wanted to get both pair done by the end of the holidays – nope! It’s quilts instead. Gotta follow the inspiration. Oh, and I never work on more than a single project at a time, and here I am deeply engrossed in two. This morning I constructed a new black ombre/batik panel (from the fabric I had left over yesterday) and then assembled the convergence. Yesterday when I cut the two parts into strips at the same time, my strips were exactly the same width. But cutting the second panel today meant there were slight variations in the pieced strips so assembling the large panel proved finicky because many of the joins did not align precisely…. I had to make lots of small adjustments. 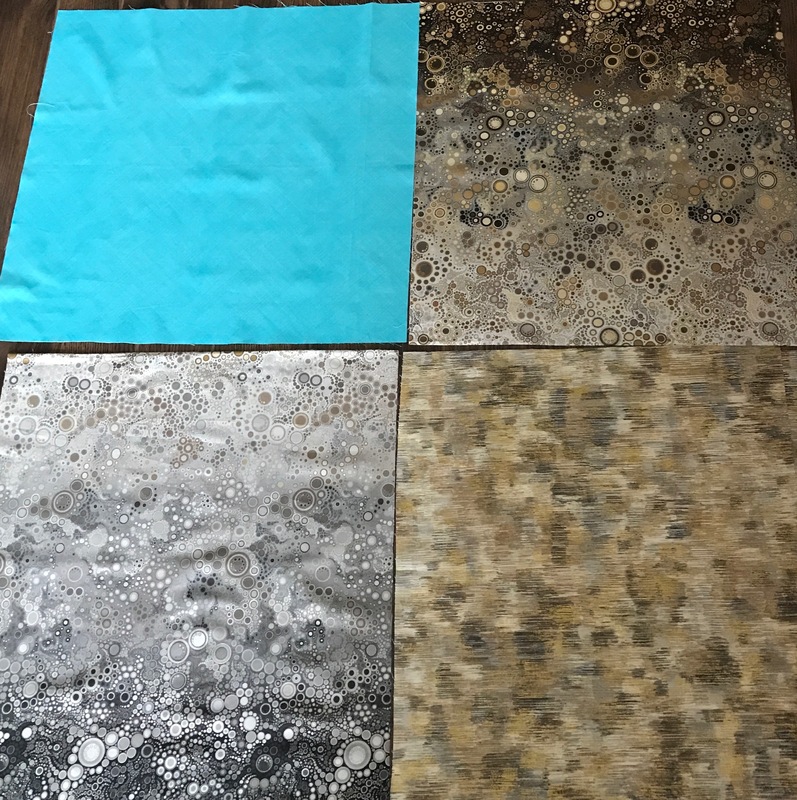 However, now I’ve got the balance the way I want it with the two darker elements of the ombre opposing one another as are the two contrast fabrics. The question is where do I go from here. I need a narrow sashing of some kind but I’m not sure what it should be. 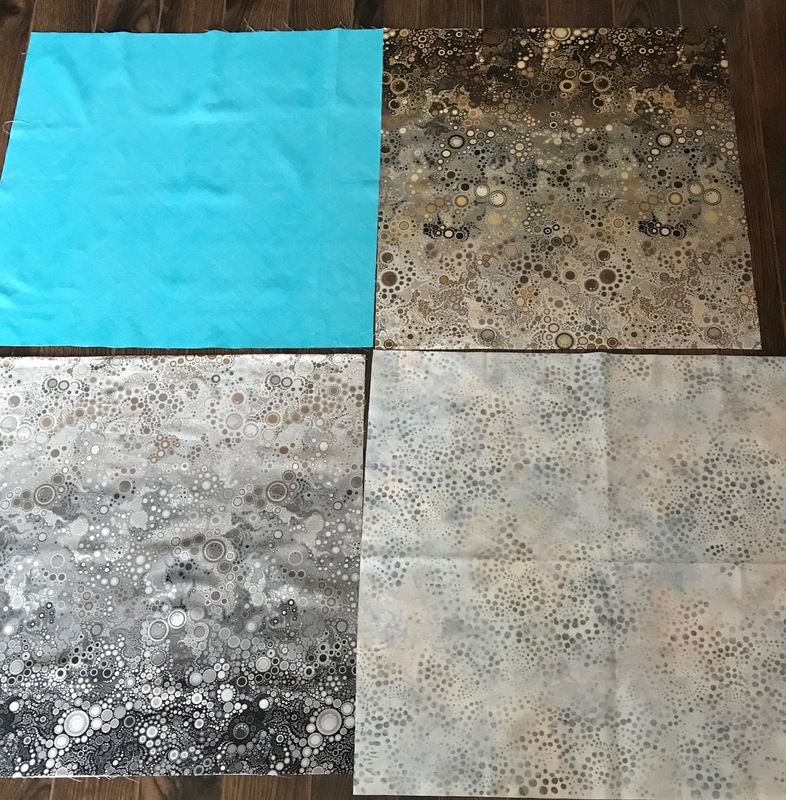 Also I have no more ombre (I’ve ordered 2m online but it probably won’t arrive for a couple of weeks) to set up wide outside borders to make a decent size throw quilt. Right now the panel is ~36″ x 36″ – I want to end up closer to 60″. That means more piecing of some kind – at the moment I have no idea where to go from here. Next question is whether there is a way to end up with a throw that’s longer than wide – that means doing something asymmetrical with sashing and borders. 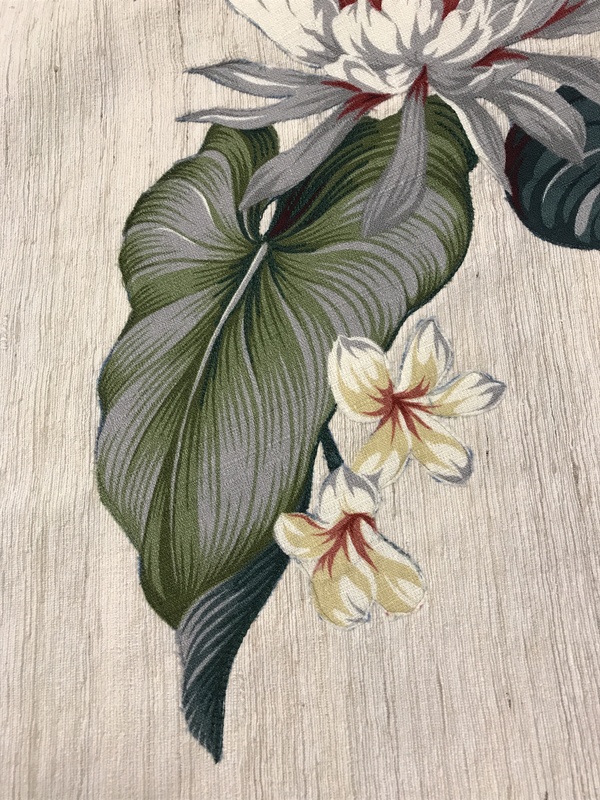 The surprise with this piecing is while the ombre shading comes through due to the wider elements constructed from the darker ends of the fabric, it’s actually a rather weak colour flow. The turquoise livens up the panel but now the question is whether I should introduce more fabrics to build around this panel or wait till the ombre fabric arrives and see what I can do with that. Lots of possibilities…. Christmas day is just another day. I read the news (stupid way to start the day these days – nothing but seriously ominous views of the world). 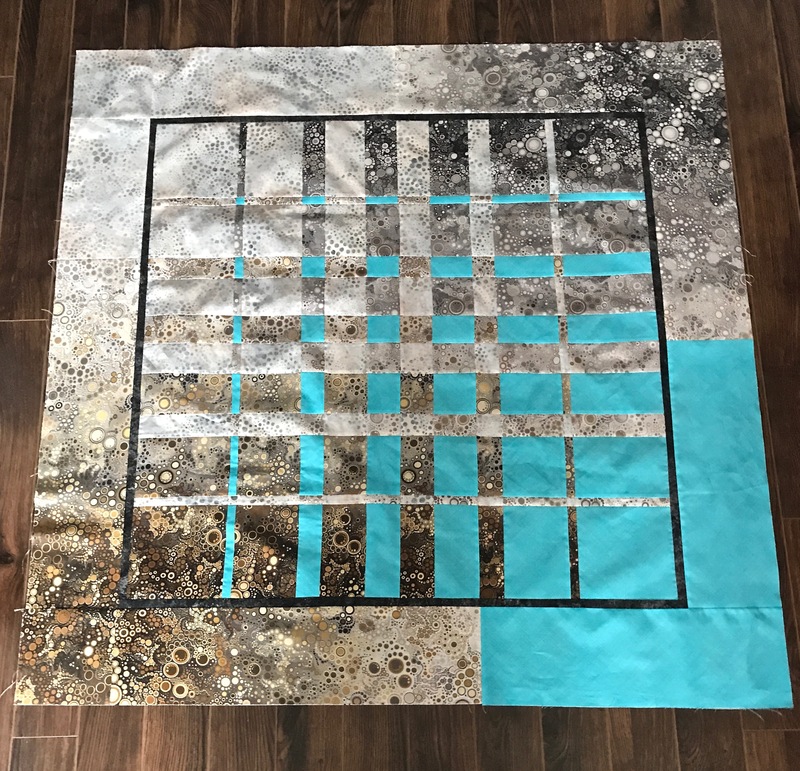 Then I picked up the strips I constructed yesterday, dug out some grey backing fabric from my backing collection and laid the strips on it – I inverted adjacent strips to mix up the colour and added one narrow contrasting turquoise. Now the strips aren’t fighting the complementary fabric. This is a possible arrangement for a quilt top. But I wondered what it would look like if I kept the strips all in the same direction and skewed them a bit and I think I prefer this layout. I’ll cut off the overhanging bits and resew them at the opposite end so the strips will be the length of the width of fabric. I will mirror strip widths in the interstitial fabric so the assembled top will have a balanced feel. I didn’t stop there. 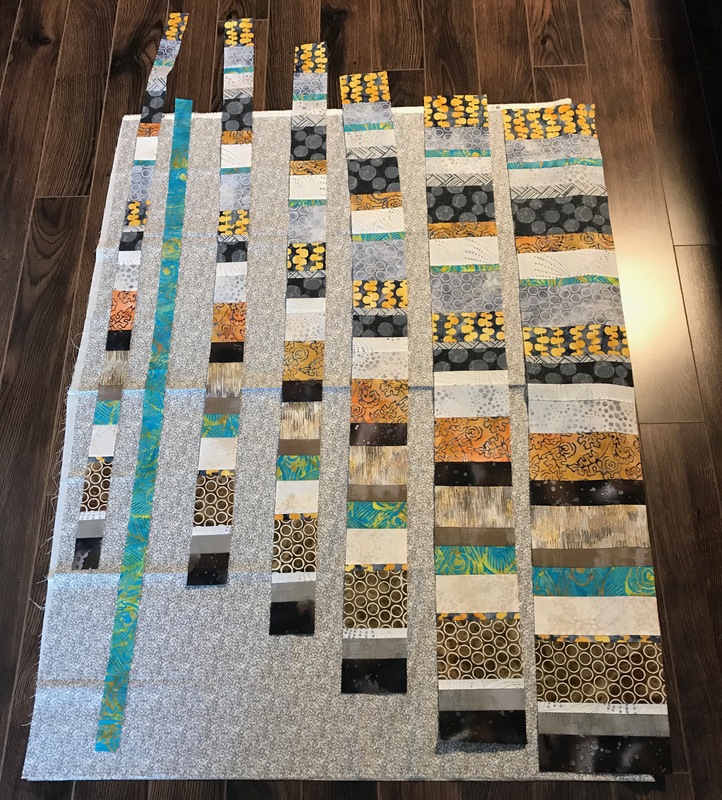 Here is the first pass at the convergence quilt – and I got it wrong! 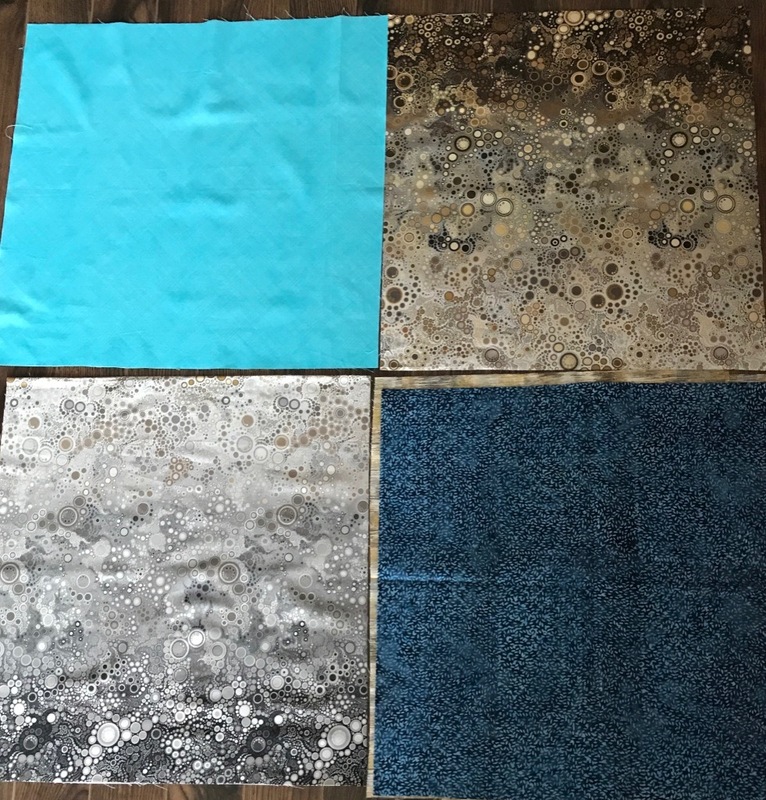 The ombre/turquoise is right but the batik/ombre is backward – I wanted the dark to go from wide to narrow and I inadvertently did the reverse. Doesn’t look awful like this but the balance is not what I was aiming for – I wanted the two dark parts of the ombre to be at opposite corners from one another. I must have laid the ombre/batik panel upside down when I cut the strips. 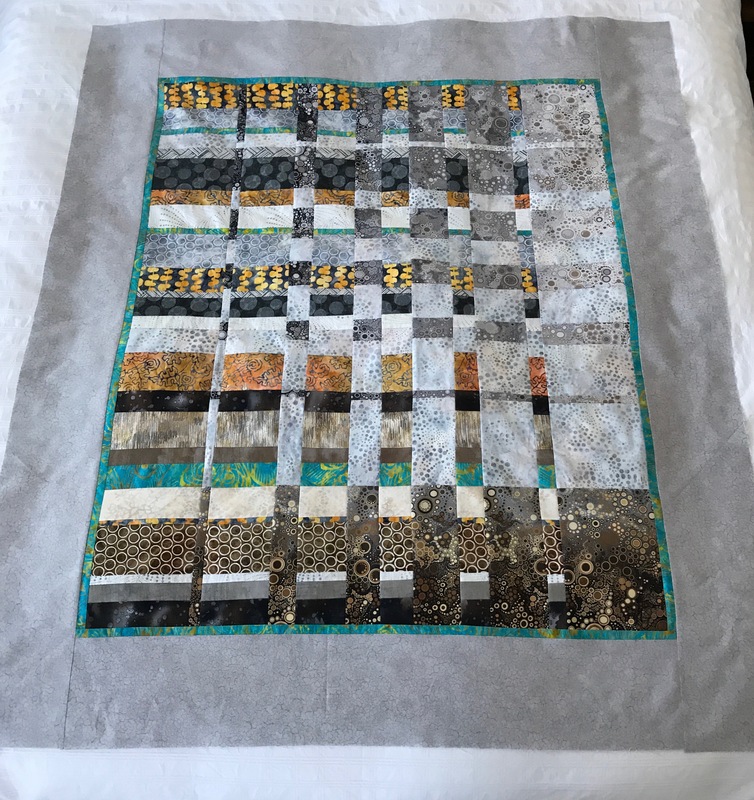 Fortunately, I have another dark ombre piece and enough of the batik to recut/resew/and recut those strips – wasn’t planning on having to do that, however. This is one of those times it’s a good idea to stop and walk away from it all. Take a breath and come at it again tomorrow. Season’s greeting to anyone who has bothered reading this far. That pile of fabrics with the Ombre fabric as central has been calling out to me. So this morning I decided to have a go. My idea was to keep the ombre as intact as possible and to set up some kind of convergence idea using the other blending/contrasting fabrics. Well that didn’t work! The strips of contrast fabrics kill the ombre – they’re way too strong; they overwhelm the ombre fabric. I’ve gathered them up and put them aside to use them in something else. 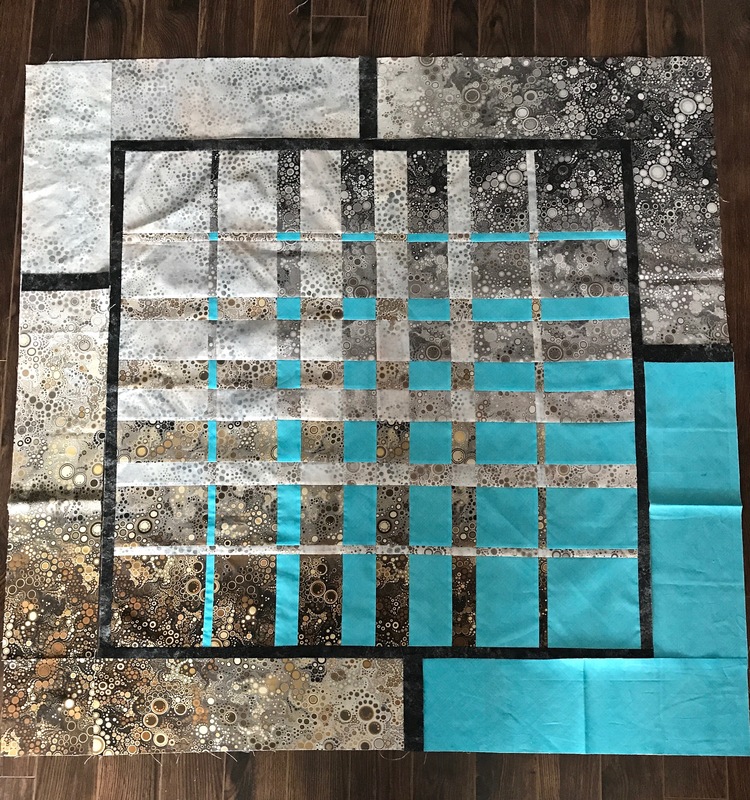 So then back to Ricky Tims basic convergence quilt idea – four squares of blending/contrasting fabric which are cut into graduated strips, sewn together in one direction, then sliced again in graduated strips and stitched once more. The question is what will go with the two blocks of the ombre. I tried a light and dark turquoise – the darker fabric is lifeless against the ombre. The lovely lined fabric doesn’t have near enough contrast to work at all. I will walk around that for a day or so before cutting further – at the same time going through my stash again to see if I have any other fabrics that might work better. My first convergence quilt had strong contrasts and worked out well. The contrasts with the ombre fabric aren’t so defined although the ombre sets up a workable contrast in two quadrants. The challenge is finding appropriate fabrics for the other two quadrants. 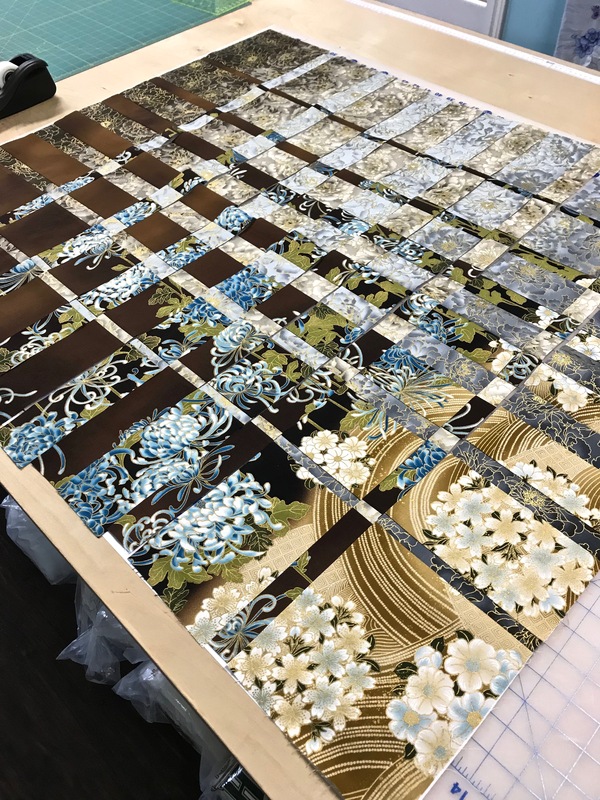 This convergence quilt in progress was created in a class I taught a year or so ago – the participant had two lovely contrasting ombre fabrics which blended together amazingly well. I don’t have a second ombre so I’m trying to set up the contrasts another way. This is how improvisation works – one idea doesn’t pan out, you try another until something just feels right. I’m working on the feels right part – not there yet!